Blog — I Can & I Will! August is SMA Awareness Month! Brooke and Brielle were given the special opportunity to design their own candles for SMA Awareness Month by the Charlotte Candle Company! They both created their own labels and chose their own scents! #100Miles4SMA in the month of August - SMA Awareness Month! Challenge yourself and your friends to complete 100 miles of movement in the month of August to raise awareness for Spinal Muscular Atrophy! Run, Walk, Bike, Swim, Wakeboard, Ski, Garden, Beach Stroll... whatever gets you moving for a purpose! It's that easy...SO GET MOVING TO MAKE A DIFFERENCE!!! August is SMA awareness month and we are challenging ourselves and YOU to help us spread awareness and complete 100 Miles for SMA. Challenge your friends, groups, teams and families to join us on the Facebook event page and post your daily or weekly progress and let us know when you hit 100 miles! This is a virtual event and can be completed anywhere! We will be there to cheer you on! Have you ever wondered what to do with the old wedding dress in the back of the closet? The "Everyone is a Bride" Pub Crawl is a great way to reuse that old wedding, or bridesmaid dress from your closet. Lets meet up at Bronson Park and raise some awareness for Spinal Muscular Atrophy! NASCAR Driver Dale Earnhardt Jr. is wearing cream colored skeleton driving gloves this month at all races in honor of Brooke, Brielle and the many other people who live with ‪#‎SpinalMuscularAtrophy‬. Brooke and Brielle were able to meet him and his fiancée Amy, to personally thank them. B&B had so much fun at Michigan International Speedway and at one point, Brielle said her eyes were tearing up because she was so happy to have this experience. If you have ever been to a racetrack in person you will know what she means, there is so much to see and do! Dale Jr. let Brooke and Brielle try on the gloves on pit road by his race car just before the race started and they thought that was really COOL. Dale Earnhardt, Jr.'s race worn gloves will be put on eBay at the end of the month with proceeds benefiting Fight SMA. We're halfway through the month of August! How many miles do you have? A bipartisan bill that would make significant changes to the process for developing new drugs and medical devices overwhelmingly passed the House in a 344-77 vote Friday morning. The bill, called 21st Century Cures, was cheered by rare across-the-aisle support from politicians, with 230 co-sponsors nearly evenly split between Democrats and Republicans. The pharmaceutical industry, patient advocacy groups, and medical organizations also support the bill, which calls for an additional $8.75 billion for the National Institutes of Health. We are SO honored our journey with SMA is being featured by ABC News! Hooray for spreading awareness about rare diseases, specifically Spinal Muscular Atrophy! Rare Disease Day is February 28th. Eric and I were honored to be able to attend the 21st Century Cures roundtable October 7th 2014 at the Western Michigan University Homer Stryker M.D. School of Medicine. We were excited to meet Dr. Francis Collins, the Director at the National Institutes of Health (NIH). We were surprised when he already knew about our family and our "Princesses." He was very understanding about the disease (SMA) and compassionate about our daughters. As National Institutes of Health (NIH) Director Dr. Francis Collins says, "We've never been in more exciting times scientifically than we are right now - But there is no time to waste… Medical illness should not be a political issue. It is an issue for ALL of us." Dr. Collins recently took part in the 21st Century Cures Roundtable Western Michigan University Homer Stryker M.D. School of Medicine. The ‪#‎Path2Cures‬ bipartisan initiative, lead by Chairman Fred Upton, increases national focus on the steps that can be taken to accelerate the cycle of cures. View the entire roundtable video here. Eric and Sarah with Dr. Francis Collins, Director of the National Institutes of Health. NORD Hosts "Portraits of Courage Celebration"
It all started three years ago when we met with our Congressman to tell him about two special constituents in his district who have Spinal Muscular Atrophy and also to gain his support for the National Pediatric Research Network Act (NPRNA) - legislation created and championed by Fight SMA. Since then the NPRNA has passed Congress and has been signed into law by the President. Chairman Fred Upton continues to push for accelerated cures in America by recently unveiling the 21st Century Cures initiative. The Energy and Commerce Committee released a video highlighting the merits of the program and cited the passage of the NPRNA as a model for Congress to use as it considers ways to support medical research in the future. The video can be found at http://bit.ly/about21stCC. 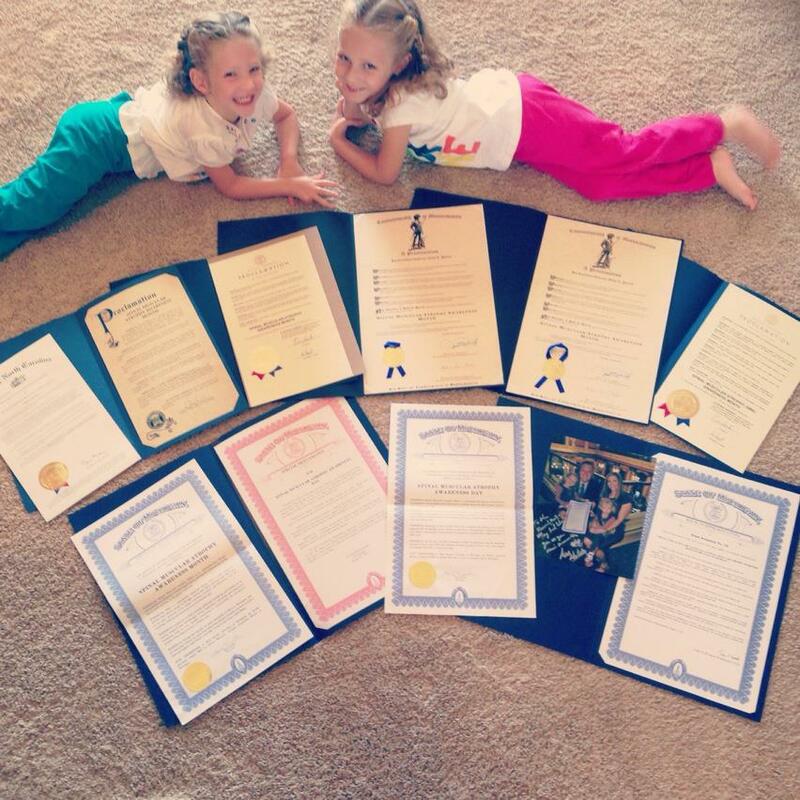 August is Declared Spinal Muscular Atrophy Awareness Month in the state of Michigan! Michigan is going to be joining the other states - declaring August as “Spinal Muscular Atrophy Awareness Month!” This marks our fourth year of being involved in getting recognition for all the families dealing with SMA (past and present). With the help of our State Senator Tonya Schuitmaker﻿ we were able to get the Proclamation again this year! Our State Representative Aric Nesbitt﻿ will introduce the resolution on the House floor for us too! The State Senate will pass the resolution in the last week of August and the House will pass the resolution in the first week of September. We are so excited!! We will be sure to post pictures once we get the resolutions! Michigan is going to be joining the other states - declaring August as “Spinal Muscular Atrophy Awareness Month!” This marks our fourth year of being involved in getting recognition for all the families dealing with SMA (past and present). With the help of our State Senator Tonya Schuitmaker﻿ we were able to get the Proclamation again this year! Our State Representative Aric Nesbitt﻿ will introduce the resolution on the House floor for us too! The State Senate will pass the resolution in the last week of August and the House will pass the resolution in the first week of September. We are so excited! !We will be sure to post pictures once we get the resolutions! A resolution recognizing August 2013 as Spinal Muscular Atrophy Awareness Month in the state of Michigan. Participate in the Pampered Chef Fundraiser! Hurry because orders are due August 3rd!